Pressure flakers are used to press off finishing flakes from small arrow points or in the retouch of larger points and blades. These are our new and improved birch pressure flakers, much more durable and longer lasting than the old ones. Sharpening instruction reminder stamped on the handle. You CANNOT use copper-tipped pressure flakers for percussion flaking, or for the removal of large thinning flakes. For those tasks you will need an antler or metal billet. 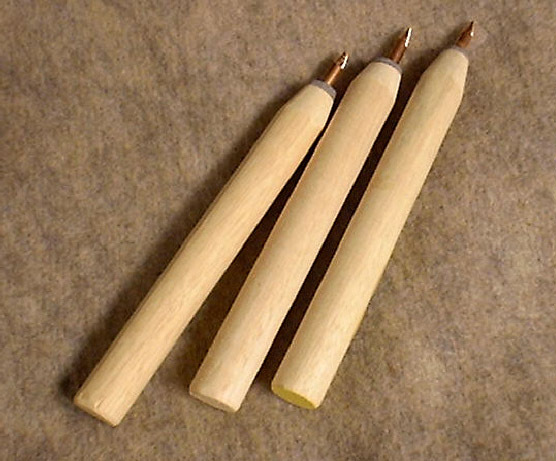 Pressure flaking is a retouch and sharpening technique used for small arrow points and after percussion flaking. 6 inch x 3/4 inch wooden handle with copper tip.